Citizenship Planning | GCI - Global Citizenship Investment. We are the world's leading experts in advising foreign investors on Citizenship & Residency by Investment. The Consultant Middle East is in advanced talks with Serbian Government for The Individual Investment Program (SIIP). The entire procedure will be fully established and ready to be applied within current year 2015. Our clients are wealthy individuals and families, as well as their advisors worldwide, and they rely on our expertise and experience in this specialized area. We provide the best advice to our clients regarding suitable options and programs currently available for acquiring alternative citizenship. Over the years, our specialised teams have assisted thousands of clients to acquire alternative residence and citizenship, and are responsible for more than USD 1,5 billion in foreign direct investments worldwide. In addition to advising private individuals and families, The Consultant Middle East has a unique position in being the worldwide company to have advised multiple governments on projects ranging from strategic consulting to the design, implementation and operation of investment-related residence and citizenship programs. Today, a person does not need to limit his or her life to only one country. Making an active decision with regard to your citizenship gives you more personal freedom, privacy and security. The Consultant Middle East has the necessary expertise and experience to advise and assist clients in regard to their decision. As a client of The Consultant Middle East, you will receive integrated solutions rather than isolated advice. By working closely together as a team, our specialists bring their knowledge and experience so that the specific details of each client`s case are considered from all relevant perspectives. Not only you do have a large number of experts at your disposal, but you will have also a personal advisor who coordinates the various specialists and ensures continuity of strategy and service. 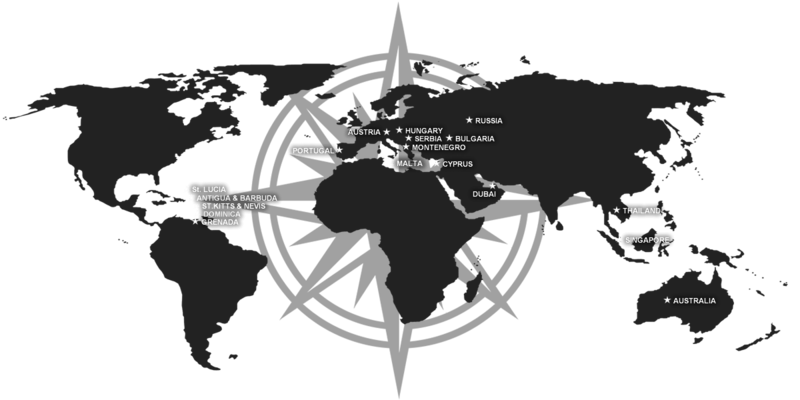 The Consultant Middle East has the expertise to offer realistic and the best legal options. There is only a limited number of countries which offers citizenship by investment programs and for which The Consultant Middle East have passed the country due diligence – Austria, Antigua and Barbuda, Cyprus, Dominica, Malta, and St. Kitts and Nevis – or a clear route to citizenship following a reasonable period of residence, such as Australia, Belgium, Canada, Portugal, Singapore, the United Kingdom or the United States. Every day, not only individual private clients and families, but also their trusted advisers worldwide, rely on us for our specialist knowledge in citizenship planning. This includes comparative citizenship laws, the relinquishment of citizenship, and the acquisition of second citizenship based on residence, ancestry or through a citizenship program. The specialized services of The Consultant Middle East are a reliable source and complementary advisory to other international firms. We regularly help law firms, private banks, family offices and other wealth management professionals with the unique and specific details required for citizenship planning for their clients.